Filled with forests, gorges, mountains, canyons, and more, Colorado boasts some of the most diverse landscapes in the entire US and is a hugely popular destination with zip line enthusiasts. There are dozens of great zip line locations all around the state, offering unique guided tours and experiences you'll never forget. No matter what kind of zip line adventure you're looking for, Colorado is the place to be. Just a short drive outside of Denver, Denver Adventures offers some of the longest and fastest zip lines in the whole state of Colorado. This company's zip line tours feature up to six zip lines in total, ranging from 850 feet all the way up to 1,900 feet and offering flight speeds of around 60 miles per hour! For a truly thrilling zip line experience, this is one of the very best options in all of Colorado and is also the only zip line course located in a Rocky Mountain nature park. If you're looking for long zip line tours with a lot of cable and plenty of airtime, Royal Gorge is a great place to be. This zip line operator runs two separate courses. The Classic course is the ideal introductory option, while the Extreme course is perfect for more experienced zipliners looking for a bigger burst of adrenaline and more thrilling flights. The Extreme course has been ranked as one of the fastest in the entire US and both courses offer stunning views of Cañon City and the surrounding area. Take in one of Colorado's stunning canyons with this super zip line tour. Six separate zip lines ranging from 200 to 700 feet in length send you sailing above and through the Lost Canyon, while also providing views of the Rocky Mountains all around. This location also features a fun aerial adventure course with various obstacles and nine separate routes to navigate. It’s a great spot for families and offers great value entry fees too. Colorado is of course famous for being one of the home states of the Rocky Mountains, which provide the perfect backdrop to these super zip line tours. Fly through the skies far above the ground and take in all of the beautiful views in every single direction on these incredible, unforgettable zip lines. This operator runs a whole host of different tours to suit every kind of visitor, with some tours also including snowmobile and train rides too. Set in the beautiful area of Castle Rock, this adventure park provides much more than just zips lines, with various aerial adventure courses and obstacles to enjoy for visitors of almost all ages. The Castle Rock zip line tour features 10 zip lines in total with one and a half miles of cable overall. The final line measures up at 1,500 feet and gives you a chance to race to the finish against a friend or family member. Offering speeds of up to 50 miles per hour, this is another great zip line tour for thrillseekers. There are plenty of great zip line options all around Colorado, but it’s important to remember that each one will have its own rules and regulations. 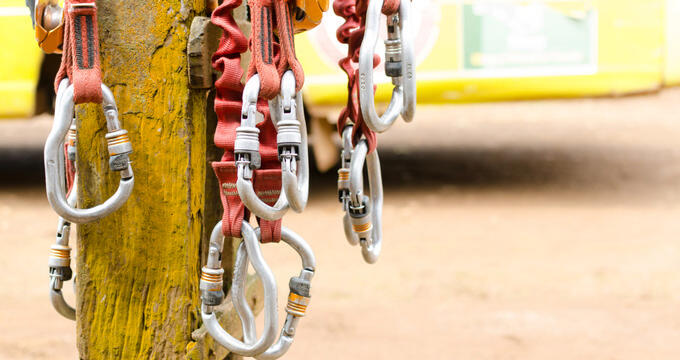 Ziplining is a completely safe activity, but rules are in place to guarantee that safety. This is why many tours and zip line experiences will have individual age, height, and weight limits. Weight limits often range from a minimum of around 60-70 pounds up to a maximum of around 230-250 pounds, but this will vary from one operator to the next, so it’s important to get in touch with each zip line company before booking your tour. In addition, on the day of your zip line tour in Colorado, it’s important to prepare appropriately. Bug spray and sunscreen can be essential in many locations, and close-toed shoes are also vital, as sandals or similar loose footwear will not be permitted on most zip line tours. Guests with long hair will need to tie it up for safety reasons and all participants will have to sign waivers before setting off.